As Great Blue Heron Week enters its 30th year, we answer all your burning questions. Like, which beer should I drink to celebrate, and what poem should I recite? Lest you forget, Portland didn't always put birds on it. (And by it, we mean everything.) We can pretty much name the time that things started to take off: spring 1986, when (then) fantastically mustachioed mayor Bud Clark proclaimed the Great Blue Heron as Portland's official bird. Ever since, we've celebrated this striking winged megafauna via Great Blue Heron Week: this year running June 1–12 and packed with guided hikes, kayak tours, and urban birding. (This year, Clark even returns to emcee the proceedings.) We know you've got questions—and have we got answers! 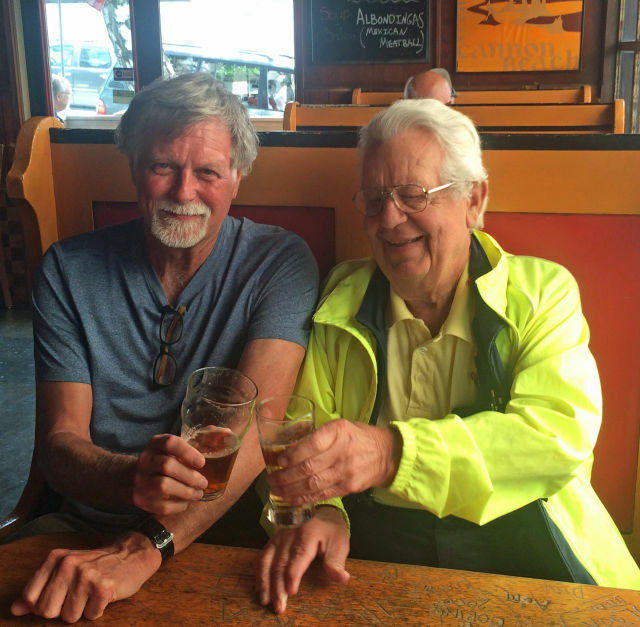 Long-time urban nature advocate Mike Houck and former Portland Mayor Bud Clark toast the 30th anniversary of the 1986 proclamation making the Great Blue Heron our official city bird. Back in spring 1986, urban naturalist Mike Houck—now director of the Urban Greenspaces Institute—overheard Clark (a former tavern owner known for lederhosen and modeling for Portland's infamous "expose yourself to art" poster) at a conference waxing eloquent on the herons he'd witnessed gliding past city skyscrapers from his canoe. Houck seized the opportunity to pitch his idea to the mayor: that the Great Blue Heron should be the city’s official bird. Clark gave the idea his trademark affirmative of “whoop, whoop,” and two weeks later, the proclamation was made. Alas, this beer has flown the coop. I want to raise a glass to honor this majestic creature, but what should I be drinking? Once, this was an easy call. 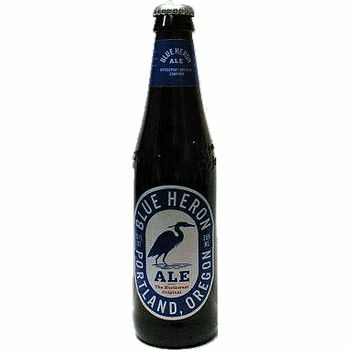 Bridgeport Brewing Company created Blue Heron Pale Ale shortly after the proclamation was made by Clark to name the heron the official bird. Until recent years, this smooth ale was considered one of this foundational craft brewer's flagship beers. But alas, the Blue Heron Pale has been retired. Sooooo, um, maybe stay in the moment with a nice blue heron koozy or coaster? What else should I do to celebrate besides actually trying to see Great Blue Herons? I don't golf. What else? Get literary—the legendary writer William Stafford penned “Spirit of Place” for the proclamation's 2nd anniversary. Houck says that this powerful poem perfectly captures the idea of the heron and Portland’s love for the earth. Check it out—we put lots of birds on this mausoleum. Poetry makes my neck hurt. What else? Check out this mausoleum. Oaks Bottom Wildlife refuge isn't just a potentially great place to peep Great Blues—it's also the site of the Portland Memorial Mausoleum. (Stay with us here.) 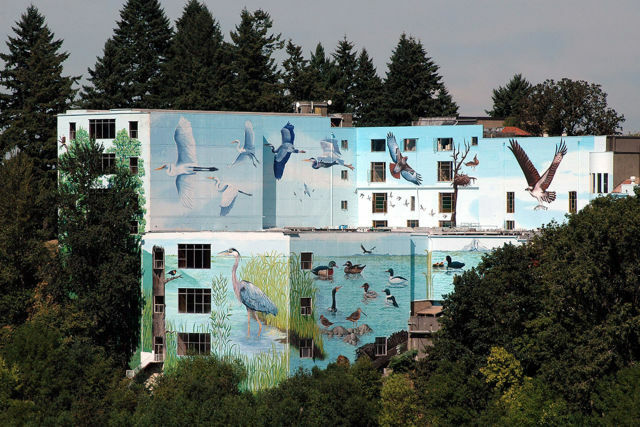 The west-facing wall of the building has a 70-foot-high mural created by ArtFX to honor the largest bird in North America. The art was updated again five years ago—making it now the largest mural in the United States. What's the point though? Why have a city bird, and celebrate it every year? June 12, with activities across the region.